Ethereum, the world’s #2 cryptocurrency, with its impressive capabilities, has become a force to be reckoned with in the cryptoverse. One of its few criticisms, however, is it’s current mining method, PoW. That, however, is set to change. In this post we will explore Ethereum’s move to PoS. With the first release of Casper, Ethereum will transition from pure Proof of Work (PoW) to hybrid PoW/PoS. According to Buterin “In this scheme, all of the proof-of-work mechanics will continue to exist, but additional proof-of-stake mechanics will be added”. As Ethereum prepares to make a radical shift in its Blockchain consensus algorithm from Proof of Work (PoW) to Proof of Stake (PoS), here is a brief overview of all that transpired till now – and the changes that are planned. Ethereum was created in 2013 by the Russian-born programmer Vitalik Buterin when he was just 19. In basic terms, Ethereum is a distributed public blockchain network that runs smart contracts. For an in-depth analysis, check out our article on Ethereum. Just how Bitcoin mining earns Bitcoin, in the Ethereum blockchain, miners work to earn Ether, a type of crypto token that fuels the Ethereum network. Ether is a tradeable cryptocurrency which is also used to pay for transaction fees and services on the Ethereum network by application developers. Ethereum’s ultimate aim is to grow into a decentralized world computer that replaces server farms. Imagine it as one computer that can be used by the whole world, which cannot be turned off. Each update of Ethereum is planned to align this mission. So, every stage is designed to help Ethereum to scale while adding new features and improving security and user-friendliness of the platform. We will now look at each in turn. Phase #1 Frontier: This was the first live release of the Ethereum network. Launched in July 2015, this phase introduced the mining of Ether and started building dApps and tools. Phase #2 Homestead: This happened in March 2016 and was the first production release of Ethereum. This phase introduced many protocol improvements. These became the foundation for improving transaction speeds and for future upgrades. Phase #3 Metropolis: This phase focused on building a lighter, faster and more secure Ethereum. It includes two hard forks – Byzantium and Constantinople. Phase #4 Serenity: This would be the final phase wherein the long-awaited Proof of Stake (PoS) using Casper consensus algorithm will be brought in. Ethereum’s move to PoS: why move from PoW? The short answer – to reduce the power consumption of the Ethereum network and avoid enormous waste of energy. Proof of Work (PoW) and Proof of Stake (PoS) are both algorithms for reaching consensus on the blockchain. However, the approach is quite different. In PoW, miners attempt to solve complex mathematical problems, which requires massive computing power and electricity. There are disadvantages like the possibility of 51% attack in PoW protocol. On the other hand, in PoS protocol, the miner putting up a stake – basically locking up an amount of their coins – to verify a block of transactions. So, the higher the stake, more the percentage of blocks that he can confirm. Ethereum currently uses PoW algorithm and plans to move to PoS protocol shortly. Casper is the name given for the ‘proof-of-stake’ protocol for Ethereum. It is actually a combination of two research projects – Casper the Friendly Finality Gadget (FFG) and Casper the Friendly GHOST: Correct-by-Construction (CBC). They are referred to as Casper FFG and Casper CBC. The final form of Casper is expected to draw from learnings from both FFG and CBC. Casper FFG: Nicknamed as Vitalik’s Casper, this is a hybrid POW/POS consensus mechanism. Here, there is a PoS protocol overlaying on top of the normal ethash PoW protocol. So even though blocks are still going to be mined via POW, every 50th block is going to be a PoS checkpoint wherein finality is assessed by a network of validators. In short, Casper FFG PoS system on the current PoW chain to create a PoW/PoS hybrid and it focuses more on a multi-step transition to introducing PoS for the Ethereum network. Casper CBC: This is being developed by Vlad Zamfir. Casper CBC is intended to replace the current PoW system used by Ethereum so that the main chain produces blocks through PoS. Casper is pretty close, sharding number one priority, Buterin recently said at a conference in Singapore. Ethereum plans to move from 100% PoW to 100% PoS in the Serenity release. Developers have programmed a difficulty bomb into Ethereum’s Blockchain so that PoS Ethereum Blockchain would be supported. This is expected to eliminate any confusion on which chain to follow – the chain with PoW or the chain with PoS. Casper is expected to fundamentally change the way the Ethereum network functions – hopefully helping Ethereum scale new heights! As no mining, in its traditional form, will take place, the issue of unnecessary energy wasting will be forgotten about. No competition in solving computational puzzles will mean no demand for advanced mining hardware. Therefore, more people will be encouraged to participate in the validation process. PoS will make attacks on the blockchain even more expensive, despite significantly reducing energy costs. If anyone decides to buy up 51% of ether to try to alter transaction blocks, they’ll have to pay millions of dollars to get the coins (due to limited supply and increased demand ether price will be increased drastically) and then risk losing their money by destabilizing the very blockchain they’ve put their funds in. Is Nav Coin built for the future of cryptocurrency? Monero: is this well known privacy coin doomed to fail? Monero describes itself as ‘cash for a connected world’. It is an open-source cryptocurrency that focuses on privacy and decentralization. It uses a public ledger to record transactions while new units are created through a process called mining. Monero aims to improve on existing cryptocurrency design by obscuring sender, recipient and amount of every transaction made as well as making the mining process more egalitarian. Many people (including dark web users) were under the impression that Bitcoin was anonymous. However, some members of Silk Road found out the hard way that because transactions are publicly recorded for everyone to see, users can be traced through their IP addresses. Monero addresses this issue by creating a privacy coin that masks the sending address, the receiving address, and the amount for every transaction on the network. Monero also uses a different hashing algorithm, CryptoNight, designed to be suitable for an ordinary PC and does not require a GPU or ASIC for mining. This reduces the costs of mining and allows for more users to participate, thereby increasing the decentralization of the network. Monero uses the same proof-of-work (POW) system as Bitcoin to validate transactions, but a different mining algorithm in CryptoNight. CryptoNight is considered to be ASIC resistant as the algorithm can run on a CPU instead of a GPU or ASIC. The algorithm is actually better suited for a CPU due to the amount of RAM it requires, and this was designed specifically so that each CPU could perform mining and have voting power in the Monero protocol. By contrast, the mining algorithms employed by Bitcoin, Ethereum, and many others perform better on GPUs and/or ASICs, and only a small group of miners can afford the hardware necessary to validate transactions on these networks. Nonetheless, almost half of the hashing power on the Monero network is controlled by 3 mining pools making it vulnerable to a 51% attack. Though several of Monero’s developers remain anonymous, we are aware that the platform is led by developers David Latapie and Riccardo “fluffypony” Spagni. In addition to the lead developers, Monero has over 240 contributors working on improving the network. Software updates are added on OpenHub on a regular basis. Monero has less than 1% of the transaction volume of Bitcoin (~$32M in transactions per day). Nevertheless, Monero is in the top 15 in market cap (~$2.6B) for cryptocurrencies. The coin has gained acceptance at a few retailers, including from several musicians such as the Backstreet Boys, Weezer, Mariah Carey, and Lana Del Ray. Additionally, Monero can be purchased through several exchanges, such as Binance, Poloniex, Bittrex, and many others. Still, the platform has not yet received widespread acceptance and is limited in where it may be used. In terms of security, Monero has many of the same advantages and disadvantages as Bitcoin. One of the main distinguishing features is the ASIC resistant hashing algorithm (CryptoNight) which was designed to combat centralization. However, dynamic block sizes and the extensive amount of information in each transaction may limit the number of miners who can run a full node on the network, so there is a bit of a trade-off there. Monero is intended to be used in a very similar manner as Bitcoin, but with the assurance of privacy due to anonymized transactions. Although it may appear on its face that Monero was designed specifically with nefarious or illegal transactions in mind for use on the dark web, there are many reasons why someone would want to transact privately. For example, on the Bitcoin network hackers and thieves may identify the wallets with the largest number of coins and target them. Additionally, as the technology progresses further, it may become easier and easier to identify the owners of each wallet and people may not want everyone to know the amount of Bitcoin or other cryptocurrencies that they own. Monero uses advanced encryption techniques to anonymize the sender and receiver of a transaction, while still allowing miners to verify that the sender had enough Monero to send to the receiver and allowing the receiver to spend the received amount of Monero in a later transaction. This is accomplished by generating one-time private and public keys for the receiver and a one-time ring signature for the sender that is a combination of the actual signature and several decoy signatures. For example, when user A sends Monero to user B, the ring signature may consist of user A’s signature and 4 decoy signatures. Additionally, in the Bitcoin protocol and many other decentralized ledgers, each user has a public key and a private key. A user signs transactions using the private key. On the other hand, in the Monero protocol users have two private keys (a private spend key and a private view key) and two public keys (a public spend key and a public view key). When user A sends Monero to user B, user A uses a combination of user B’s public spend key and public view key to generate a one-time public key. User B then employs her private spend key to retrieve the coins. Some additional privacy features are also implemented in the protocol, such as hidden transaction amounts, and hidden internet traffic through the invisible internet project (I2P). Monero does allow users to make transactions transparent to a selected auditor, for example. Monero’s main competitors are other privacy coins, such as Dash, Zcash, and ByteCoin.Currently, Monero is recognized as the leader in privacy coins due to its popularity amongst dark web users although Dash has a larger market cap. As mentioned above, Monero has an unlimited supply although the block rewards gradually drop until they reach a fixed amount of 0.6 XMR per block starting in 2022. This will lead to about 1% yearly inflation. It is also worth noting that Bitcoin could implement privacy features for example, using a second layer protocol that sits on top of Bitcoin’s blockchain. 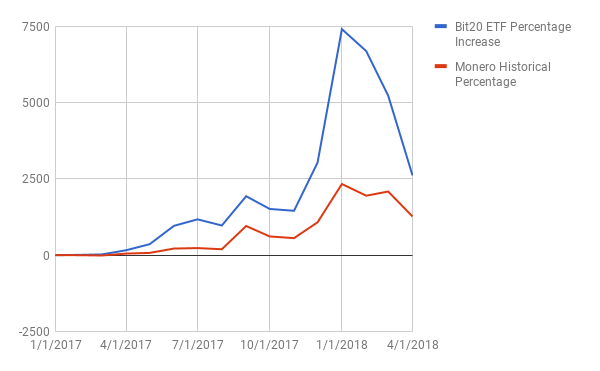 Due to Bitcoin’s advantage over Monero in networking effects, users concerned with privacy could go back to Bitcoin driving down the demand for Monero. In fact, the Lightning Network by Lightning Labs implements some privacy features although they are not as strong as Monero’s. Participants opening and closing channels on the Lightning Network record transactions on Bitcoin’s blockchain which does not include the added privacy features. Monero was launched in 2014 and is now fully developed and ready for use. As the emerging leader in privacy coins, Monero has a bright future particularly if users come to expect a level of privacy in their transactions. On the other hand, Monero has a significant amount of competition from the other privacy coins and its association with the dark web seems to taint the currency. The demand for privacy in cryptocurrency transactions for the average user in the future is unclear, but Monero has positioned itself well in the event that this feature becomes a necessity. 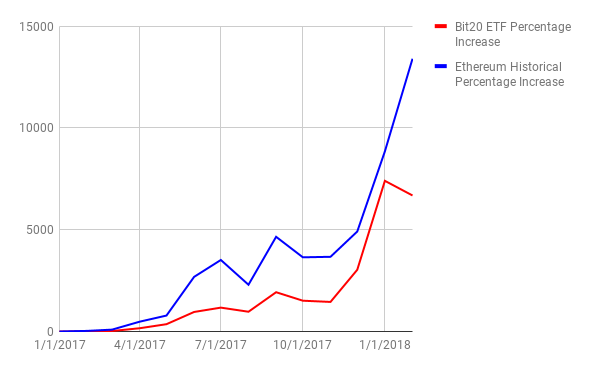 As a decentralized platform that utilizes blockchain technology, Ethereum has many of the advantages (better security, immutable, trustless, no need for a central authority) and drawbacks (scalability issues and high transaction fees) of Bitcoin Ether Percentage Increase Compared to the Average (Bit20 ETF) Starting in 2017. 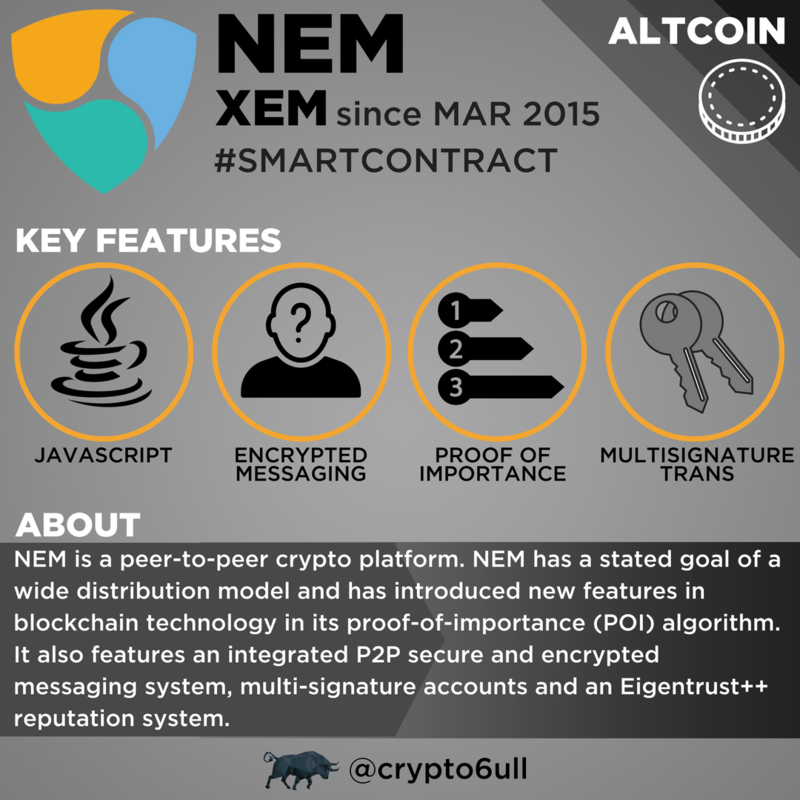 Its distinguishing feature, however, is the ability to generate and execute “smart contracts,” which are a set of terms and conditions that allow for the automated exchange of tokens or digital assets. For example, Alice may automatically receive Bob’s tokens when the Cubs win the World Series, and Bob may automatically receive Alice’s tokens when the White Sox win the World Series. Through the use of these smart contracts, companies can develop decentralized applications (dApps) on the Ethereum platform, where users receive digital assets when a particular set of conditions occur. The Ether coin is referred to as the “gas” for executing the smart contracts on the Ethereum platform, which means users have to pay a certain amount in Ether to run a contract. Like Bitcoin, Ethereum uses a proof-of-work (POW) system to validate transactions by miners required to solve a cryptographic riddle which is difficult to compute but easy for others to verify. Therefore, mining requires a large amount of computing resources and electricity. Additionally, a POW system is vulnerable to a 51% attack, where a single miner or mining pool (made up of several miners working together who split the rewards) has more than half of the mining power of the network. As a result, the miner can refuse to validate transactions and can double-spend Ether. On the other hand, the likelihood of a 51% attack is low, because this would devalue the currency that the miners are working to obtain. Currently, Ethereum is considering switching to a proof-of-stake (POS) system called Casper, where the validator for the next block is selected based on a combination of random selection, account balance, and the number of days the coins have been held. The Ethereum Foundation is led by Vitalik Buterin, a Russian-Candian programmer and entrepreneur who co-founded Ethereum before he turned 20 and has been referred to as a “boy genius.” The Ethereum Foundation includes over 200 members who are actively improving the functionality of the network. Software updates are added on Github on a regular basis. Ether has the second largest market cap to Bitcoin (~$80B) and a transaction volume of about 1 million transactions per day. 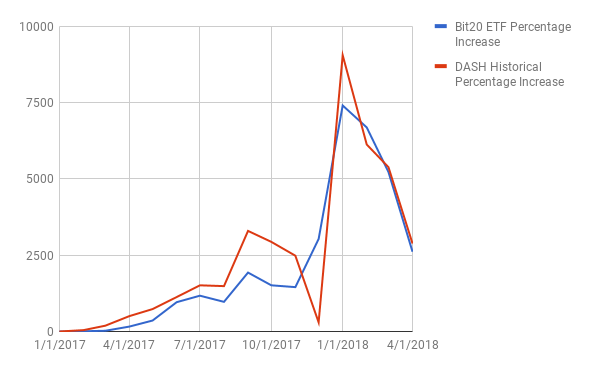 Nevertheless, Ether has been experiencing scalability issues as transaction volume has rapidly increased leading to rising transaction fees. Multiple solutions to this problem have been proposed including a multi-layered protocol similar to Bitcoin’s Lightning Network where most transactions will occur on off-chain micropayment channels. Another proposed solution is referred to as “sharding,” where nodes no longer store the full state of the network and instead each node merely stores a subset of the data. Then the nodes communicate with each other to obtain data which is not stored at a particular node. But, this system isn’t trustless since nodes need to obtain data from the other nodes. Several players have been involved in creating dApps on the Ethereum platform. This includes CryptoKitties (an extremely popular game where virtual cats have been sold for up to $100k), Eth-Tweet (a microblogging service), and WeiFund (a crowdfunding service). While we have not yet seen dApps created by large companies, some big businesses such as Toyota have been experimenting with applications utilizing the Ethereum blockchain. In terms of security, Ether has many of the same advantages and disadvantages as Bitcoin. Executing smart contracts on the blockchain may open Ether up to additional security issues, however, because the code used to run the smart contracts is made public. Everyone in the network then has the ability to review the code, find bugs, and exploit them before the developers become aware of the bugs and are able to make corrections. Ether is a utility token used as fuel for operating the Ethereum platform. This means that each time a developer creates a smart contract or issues a token on the Ethereum platform, a designated amount of Ether is transferred. Several tokens and altcoins have been created on the Ethereum platform using the token standard ERC20. These tokens include: Tron, ICON, OmiseGo, Binance Coin, VeChain, Tether, Golem, and many others. Although smart contracts can also be executed using Bitcoin, the Bitcoin smart contracts have limited functionality. Ethereum, on the other hand, uses an Ethereum Virtual Machine which executes Turing-complete smart contracts that can perform just about any computation, and are not limited to exchanging tokens. In this manner, additional information can be recorded and exchanged via the blockchain, such as identity information, product information, etc. Ethereum also utilizes oracles to communicate with the off-blockchain world for evaluating conditions in the contract. For example, if the terms of the contract indicate that Alice will receive 100 Ether from Bob if the average temperature in Chicago is over 50 degrees in January, an oracle collects temperature data for Chicago which is then evaluated by the smart contract. Currently, there are over 32000 ERC20 token contracts executing on the Ethereum platform, and this number has been increasing at an exponential rate. As developers and companies find more uses for smart contracts, the value of Ether should continue to rise. Even though the supply of Ether is technically unlimited, the issuance of Ether is capped at 18 million per year. Like Bitcoin, Ether is currently in use and several developers have created dApps and tokens on the Ethereum platform. While it is still in its infancy, developers will likely experiment with more and more uses of smart contracts. Ethereum has the advantage of being the first cryptocurrency to be used in the execution of Turing-complete smart contracts. The possibilities for these contracts are endless, and the Ethereum project has the opportunity to transform not only the legal landscape, but how people and machines exchange value. Analysis brought to you by the hugely talented Cameron Pick. Originally published on https://cryptonalysis.net which everyone follow on Twitter.